Wednesday 1st March 2017, 6:30 pm. 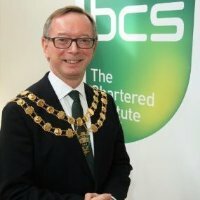 Why did you join the BCS? How has it helped you during your career? What contribution could you make as it evolves to meet the challenges of 2017 and beyond? Drawing on his own 35 year history with the BCS, this year's President Ray Long will lead a discussion on where the Institute has come from, how it is currently positioning itself to take the lead in making IT good for society, and how, at a time when a younger generation requires a different type of service from its professional bodies, it can develop during the years ahead to meet this need. Ray will consider our current strategy, challenges and areas of interest, as well as the theme for his Presidential year of driving up the success rate of IT projects. As the BCS celebrates its 60th anniversary, please come prepared not just to listen, but also to make your views known, as we debate the issues which will determine the success of our next 60 years and beyond. Ray Long joined the UK Senior Civil Service when moving to the Department of Health in 1997, before his appointment as IT Director at the Department of the Environment, Transport and the Regions in 1999. He became CEO of the Northern Ireland Business Development Service in 2004 before serving as Programme Director for the nationwide NHS Choose and Book service and Major Projects Director in the Cabinet Office. He joined HMRC as Director of Business Tax Change in 2010, before becoming Director of Corporate Services Change in 2013. In 2014 he joined the Department for Work and Pensions, initially with responsibility for that organisation's Infrastructure Modernisation Programme and, more recently, as Director of Technology Platforms. Ray has also been an Associate Lecturer with the Open University since 1993, delivering programmes on leadership and strategy in the UK and internationally. He is a graduate of the Government’s Major Projects Leadership Academy. A Chartered Fellow of the BCS, Chartered Engineer and Chartered Director, Ray served as Vice-Chair of the BCS’s Policy and Public Affairs Board between 2012-15, after being a member of that Board since 2010, and as a member of its External Relations Board from 2007-09. He has been a member of various Technology / UK IT Industry Awards Investigatory / Judging Panels since 2003. A Freeman of the City of London, Ray also serves on the Court of the Information Technologists’ City Livery Company, chairing that organisation’s Government Panel, and is a Fellow of the Association for Project Management, the Chartered Management Institute, the Institute of Directors, the Institution of Engineering and Technology, and the Royal Society of Arts, and an Associate Member of the Parliamentary Internet, Communications and Technology Forum.